Infinity GDPR Manager | Info Novitas Ltd.
INFINITY GDPR Manager is a complete modern GDPR Cloud solution that helps manage your compliance with the General Data Protection Regulation (GDPR) and significantly simplifies managing of all personal data. 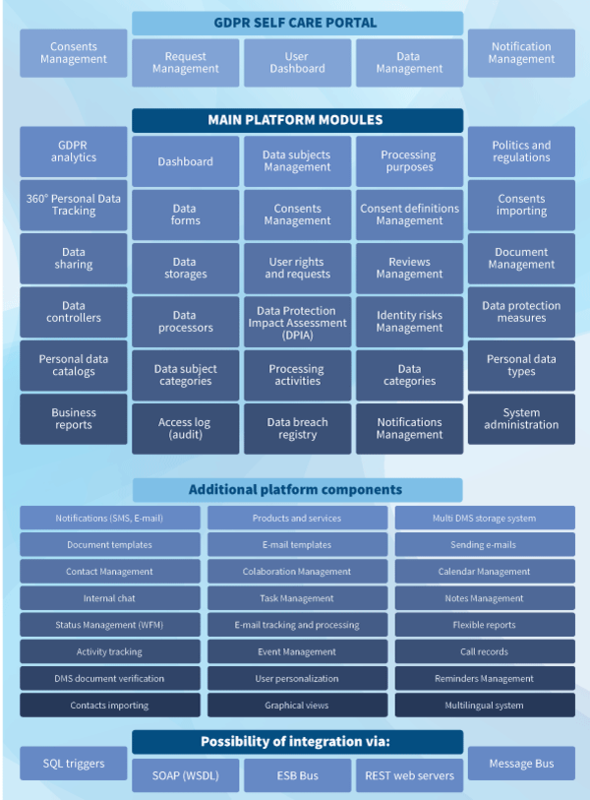 It includes important components such as: Consents Management, Data subjects Management (rights and requests), Data breach registry, Processing purposes, Processing activities, Identity risks and Risks assessments (DPIA), 360° Personal Data Tracking, Data map, Documentation, Access log (Audit), Data storages, Data forms, Data sharing, Internal policies, GDPR reports. With all the above, it includes 50+ more useful platform tools such as: Collaboration Management, Task Management, E-mail tracking and processing, Event and Calendar Management, SMS and E-mail notifications, chronological Activity tracking, Chat, Graphical views, Multi DMS storage system, Reminders, etc. 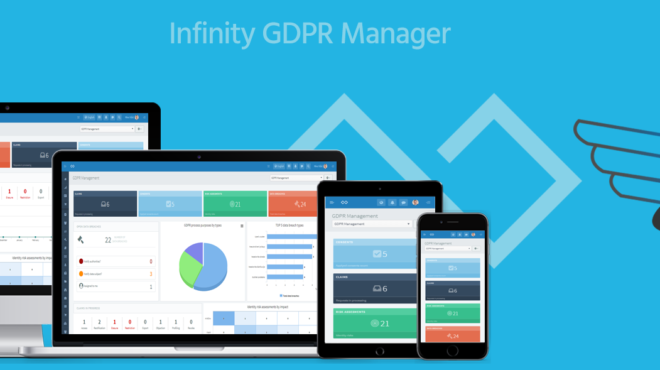 Infinity GDPR Manager comes in 5 packages: Starter, Basic, Professional, Enterprise and Ultimate. The system implementation is quickly and can be executed depending on the customer preferences in Cloud as Microsoft Azure Cloud platform can be self-hosted on private Client servers. The system is completely modular, it can be easily upgraded and adjusted to user preferences. It is easily integrated with other internal and external systems and as such is central place for Data protection Management in your organization. You can control managing and processing personal informations of your data subjects (employees, clients, suppliers) through one system. The system is multilingual and also implemented very quickly (1-2 weeks) and can be executed depending on the customer preferences in Cloud as (Microsoft Azure, Amazon AWS, Google Cloud) or can be self-hosted on private client servers. The minimum required is MS Windows Server 2012 R2 operating system and base MS SQL server 21012 Express. 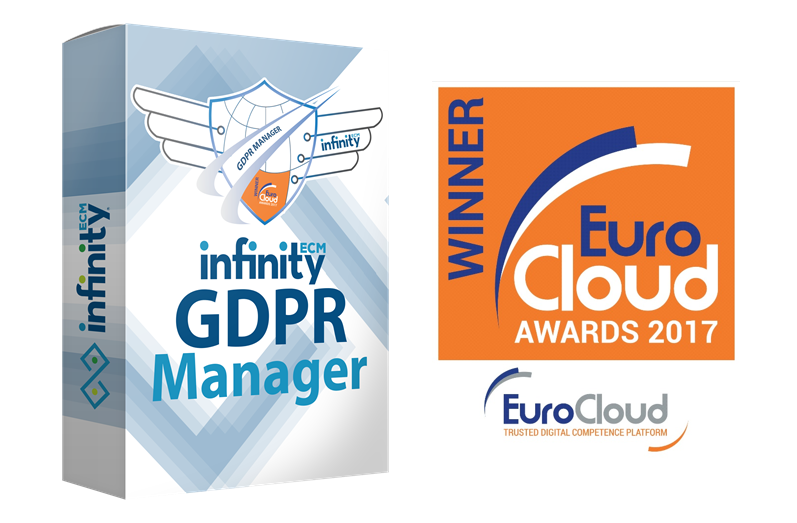 The solution is developed on the basis of our award-winning Infinity ECM platform, that includes a large number of integrated subsystems, solutions and more than 50 tools for collaboration, communication and management of the entire organization. 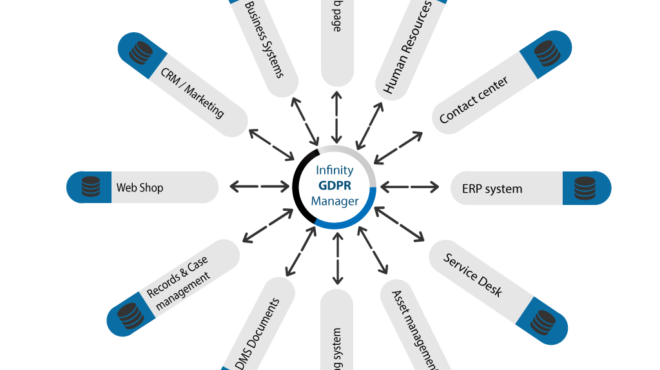 The Infinity ECM platform was declared 25. October 2017 in Brussels the best European BPaaSS system for 2017! 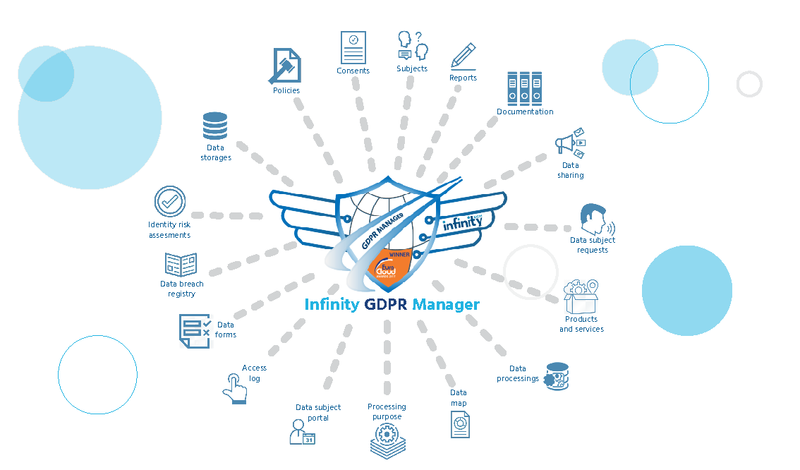 The system encompasses a wide range of functionalities important for quality compliance and personal data protection of data subjects in accordance with the requirements of the GDPR Regulation. 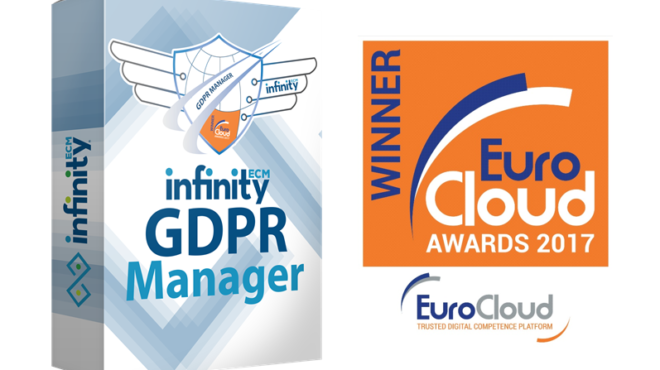 This make Infinity GDPR Manager the most comprehensive GDPR process solution in the European market. 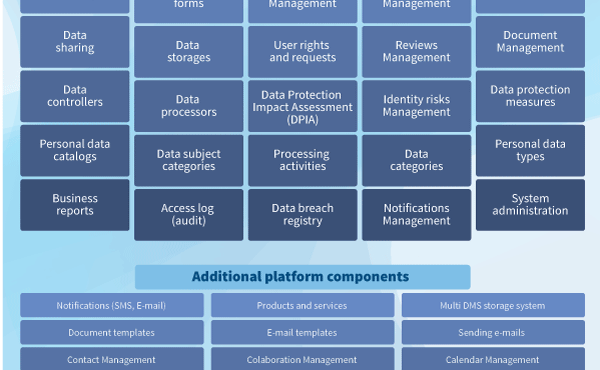 Data Protection Impact Assessment (DPIA); Risk Management, Personal data protection measures Management; Personal Data Tracking; Data breach registry (monitoring the level of severity of the data breach, monitoring the expiration of deadlines, informing data subjects and agencies via e-mail); GDPR analytics; Data processing Management; Internal policies Management; Data forms for data collection; Data sharing; Data storages (with connections to clients internal systems); Document Management (overview of documents that contains personal information, saving digital documents to the DMS system); Data processors; Data catalogs Management (data subject categories, data categories, data types); Reviews Management; Data controllers; Access log (audit); Deadlines, Tasks and activities Management; GDPR reports. 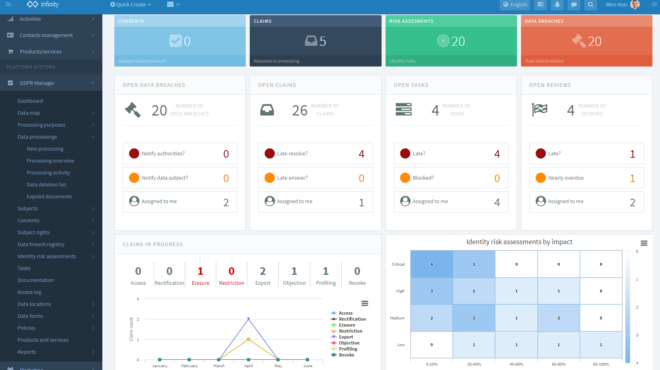 GDPR Self Care Portal (User Dashboard; Consents Management, Request Management, Data Management, Notification Management). 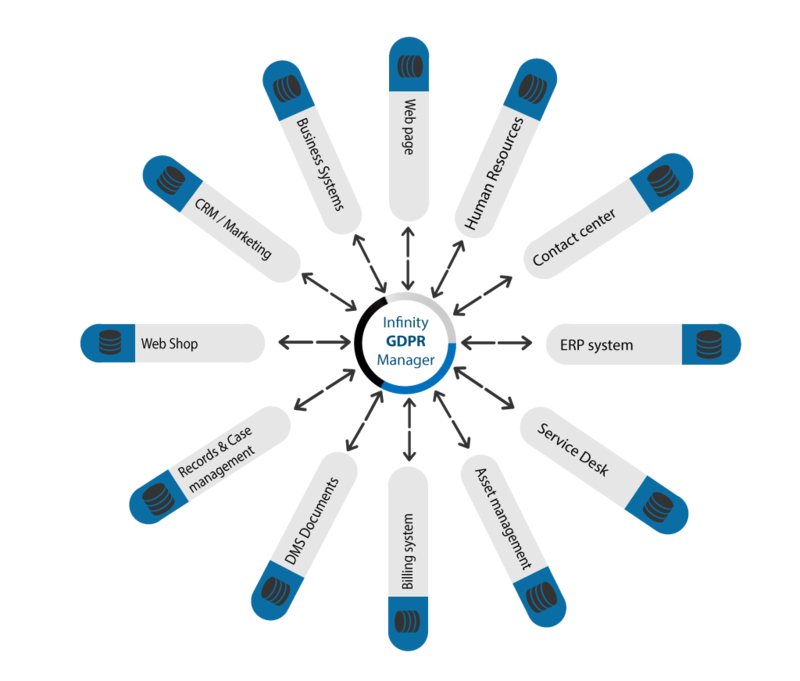 The system can be connected to other internal systems (REST web servers, SOAP/WSDL) or with ESB bus if user wants to exchange personal data with the systems: CRM; Busines core system; Human Resources; ERP/Invoicing; Service Desk; Web Portals of the Client; Client Web Shop; Contact Centre; Contracting; Asset Management; DMS system of the Client; Records Management; Archive Management system. 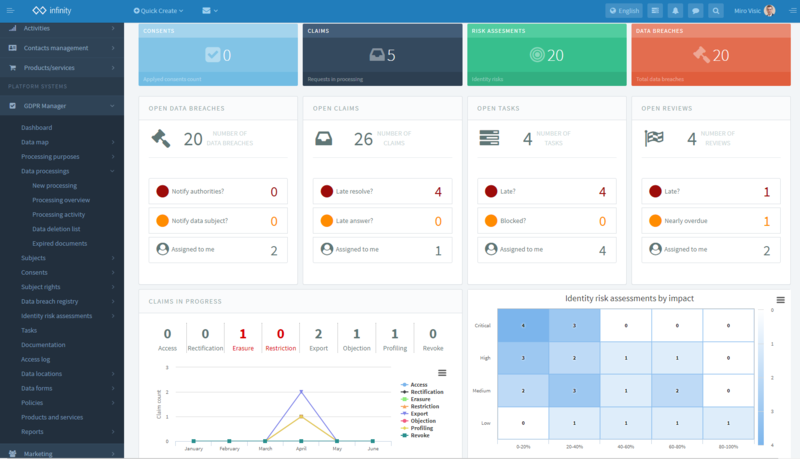 Admin dashboard (server resource overview); Basic system configuration; define settings for the modules; turn on/off different modules and plug-ins; Basic code-books; GDPR code-books Management (Legal bases; Agencies; Processing participants; Organization rolls and Organization units; Data protection officer; Consents; Processing purposes; Data subject requests, Data breches, Risks, Data sharing); Self Care Portal settings (Basic configuration; Colours, Logos); User Management; Dashboard Management (creating and adding new widgets); Layout settings; E-mail tracking; Security management (access rights, the permitted level of access, levels of privacy); Report security settings (depends on levels of secrecy); Notifications schemes Management.